Paul Lawrie’s European Tour match-play tournament has been thrown into doubt this summer after Murcar Links members were informed it is not now returning there for a second time. The shock development is believed to be linked with the oil industry toiling in Aberdeen and follows last year’s Saltire Energy-sponsored event suffering six-figure losses. It has been rumoured recently that a course in East Lothian, possibly The Renaissance Club or Archerfield Links, had been lined up to replace Murcar Links, where Thailand’s Kiradech Aphibarnrat won last August. In the aftermath of that event, which attracted a disappointing total attendance of 11,000 over five days, it is believed that Lawrie, his management company 4Sports and Saltire Energy’s Mike Loggie looked at the possibility of the 2016 tournament being staged away from the North-East. 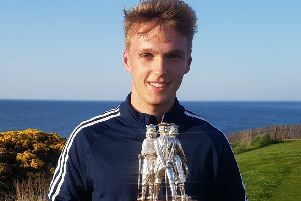 That tempatation was resisted as it was announced last October that it was set to return to Murcar Links, which had proved a big hit with the players first time around. But rumours had been circulating in recent weeks that a move elsewhere could be in the pipeline and that has now been confirmed in a letter to Murcar Links members. Furthermore, the schedule of events for this year on the European Tour’s website now has “to be confirmed” as the venue for the €1m tournament and not Murcar Links any more. Lawrie was understandably a proud man when he played host to the first European Tour event to be staged in his home city. He persuaded fellow former Open champion John Daly to take up a spot in the 64-man line-up and the event proved very successful from purely a golfing point of view. It is believed the corporate hospitality side of things failed to meet expectations, however, and that seemed set to suffer again this year as falling oil prices continue to hit the Granite City. Contacted by The Scotsman, Lawrie referred queries about the event to 4Sports but no response was forthcoming. The Renaissance Club was in the running for last year’s Aberdeen Asset Management Scottish Open but lost out to Gullane. However, it has just been announced as a future Open Championship Final Qualifying venue by the R&A, taking over as the Scottish course for that from Gailes Links in 2018. Neighbouring Archerfield Links was home to the Aberdeen Asset Management Ladies Scottish Open until last year and is set to stage the Prostate Cancer UK Scottish Senior Open for the second season in a row on 19-21 August. Moved a week back in the schedule from last year, the Paul Lawrie Saltire Match Play is due to be played on 4-7 August.